Enrico Meneghelli came to America from his native Italy in about 1876. He lived and worked, first in Boston and then, from around 1881, in New York. He exhibited his work in both cities and had a modest success as a painter of interiors, scenes of everyday life, and cityscapes. In 1879, when this painting was executed, Meneghelli was living in a Boston boarding house where his fellow residents included other artists. This painting could certainly represent one of their studios or perhaps Meneghelli’s own. When Studio Interior was acquired by the Athenæum, it brought this assigned title with it. 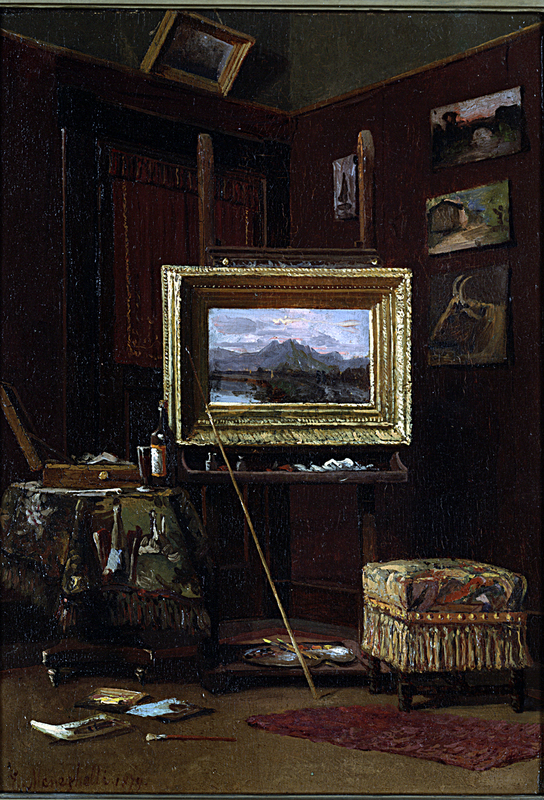 But the painting’s subject and date of execution suggest that it could be identical to an otherwise unidentified painting by Meneghelli titled Finishing the Artist’s Work, which was exhibited at the Boston Art Club in 1880. If that attribution is correct, Meneghelli may here be punning on his own participation in “finishing” the painting-within-the-painting by painting his own canvas—this painting—himself. Inscribed lower left: "E. Meneghelli 1879"